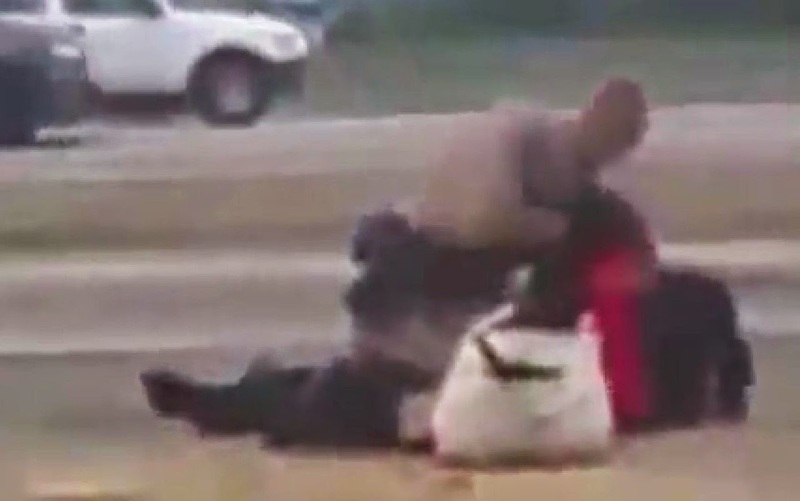 This is the shocking moment a cop was filmed repeatedly punching a woman in the face. It shows a California Highway Patrol officer chasing a woman who appears to walk off after a traffic stop in LA. As she makes her way down the busy highway the trooper catches up with her before wrestling her to the ground. He then sits on top of the woman and delivers a volley of punches to her face. She appears not to offer any resistance as another man, who was later revealed to be a plain clothes policeman, arrives on the scene. The California Highway Patrol (CHP) said in a statement to KABC-TV that the officer had ordered the pedestrian to stop but tried to arrest her after she walked off because he feared she would be hurt by traffic. They said: “A physical altercation ensued as the pedestrian continued to resist arrest, at which point a plain clothes, off-duty officer assisted in applying the handcuffs. The footage was shot by David Diaz, who slammed the cop’s actions as excessive. He told KABC-TV: "There was no weapons, it's obviously excess force at this point. He could have easily calmed her down. You can use strength without punching." The woman is believed to have been taken to a hospital for tests.